Luxurious Lakefront Estate with Private Dock! The Mercer Lake Estate Lake Home is a spectacular 5-star custom vacation home overlooking Mercer Lake with its own private dock. With 5 bedrooms, two of which are master bedrooms, this spacious and luxurious 3800 sq. ft. home has everything you could ask for in a vacation home. The spacious kitchen has everything a gourmet chef could ask for. 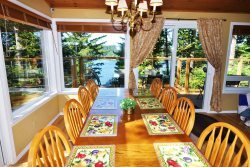 With panoramic views of the lake and countryside from just about every room as well as the largest outdoor patio overlooking the lake that you’ll ever find on the Florence Oregon Coast this fabulous one-of-a-kind vacation home has everything you’ll need for that special outing for your family or group of 12. Catch that trophy bass right from your own private dock! Enjoy campfires down by the water with your own private fire pit. Have your favorite cup of coffee out on the patio while watching the Herons and Osprey put on an aerobatic show. Wind down the day with a BBQ and relaxation while enjoying the serenity of Mercer Lake and surrounding hillside. The Mercer Lake Estate Lake Home has everything you’ll need and more. The Mercer Lake Estate Lake Home is located just 8 minutes north of Florence, on the quiet southern shores of Mercer Lake. Mercer Lake is one of over 27 lakes in the Florence area known for trophy fish. Bring your quads and sand toys and have a fantastic time at the sand dunes just 8 minutes’ drive from the Mercer Lake Estate Lake Home. Visit Old Town Florence and explore the wonderful bistros, restaurants, galleries, and shops along Bay Street. Just a few minutes south along the coast and you’ll find fun in the sun and surf at the fabulous Heceta Beach and of course don’t forget to visit the world famous and most photographed Heceta Head Lighthouse as well as the Sea Lion Caves! Entrance is thru the South Front Door to the second Floor as this home is built into the Hillside of the Lake! Wide 120’ linear driveway, Room for at least 6 Vehicles on Driveway, Garage is not available!